The Beatles 50 Years Ago Today: February 22, 1967. Beatles Radio: The Beatles, Solos, Covers, Birthdays, News The Fab 4 and More! Following the February 10th session, in which the orchestral overdubs were added to A Day In The Life, the song was completed on this day with the recording of the final piano chord. At the close of the 10 February session an ad-hoc choir was assembled for the recording of a hummed final note. This was felt to be not dramatic enough, and an alternative was sought. The idea of a piano chord was eventually settled upon. Initially using three pianos, John Lennon, Paul McCartney, Ringo Starr and Mal Evans all played an E major chord. 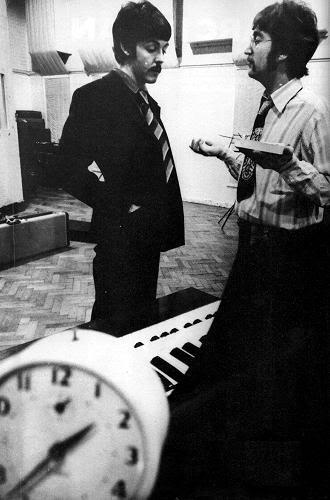 McCartney led the recording, which was captured by Geoff Emerick in the control room of Studio Two. Paul: "Have you got your loud pedal down, Mal?" Paul: "The right hand one, far right. It keeps the echo going." John: "Keep it down the whole time." Paul: "Right. On four then. One, two, three..."
It took nine attempts to record a satisfactory version, as the five performers had trouble hitting the chord at precisely the same time. Take seven was the longest at 59 seconds, but take nine was the best. George Martin playing a harmonium. I wanted that chord to last as long as possible, and I told Geoff Emerick it would be up to him, not the boys, to achieve that. What I did was to get all four [sic] Beatles and myself in the studio at three pianos, an upright and two grands. I gave them the bunched chords that they were to play. Then I called out, 'Ready? One, two, three - go!' With that, CRASH! All of us hit the chords as hard as possible. In the control room, Geoff had his faders - which control the volume input from the studio - way, way down at the moment of impact. Then, as the sound died away, he gradually pushed the faders up, while we kept as quiet as the proverbial church mice. In the end, they were so far up, and the microphones so live, that you could hear the air-conditioning. It took forty-five seconds to do, and we did it three or four times, building up a massive sound of piano after piano after piano, all doing the same thing. Mono and stereo mixes for A Day In The Life were made towards the end of the session. This required two four-track tape machines to be played in sync - a first for EMI. The main part of the song was mixed first in four attempts, numbered 6-9, onto which the final chord was then edited to create the mono master. Nine stereo mixes were then made. These were numbered 1-9, but there were problems with keeping the two tape machines in time and the attempt was abandoned until the following day. At the end of the session The Beatles recorded an experimental piece, its purpose unknown. It lasted 22'10" and primarily featured Ringo Starr's drums, augmented by tambourine and congas. A single take was recorded, and was known in the studio as Anything, or Drum Track (1).